Thanks for your helpful website and advice. period. Do you have any suggestions for minimizing the chances of this sort of poisoning? As suggested by Neal Monks, I got a bandit Cory catfish. It will grow to about 2 inches. It requires a 10 gallon tank. I have a tank rated for 29 gallons by the manufacturer. The tank is 36" L x 12" W x 18" H. The ph is 8 and nitrates and ammonia at 0. My filter is a sponge filter rated for 40 gallons. This tank contains 2 guppy females, 5 neon tetras, 10 platy fish, and numerous bladder snails. According to internet aquarium stocking sources I should have 36 inches worth of space for fish stocking. With the Cory I will add, will I be overstocking this tank? Thank you. Hello to all of you. Hope all is well. I have a couple of questions please. I am in the process (and have been for a while) of setting of a Nuvo 38 gallon tank. As I am sure you are aware, the inside of the tank is white. I have put black sand as by substrate so as to enhance the colors of my freshwater fish. The first fish I want to put in after cycling is complete is the Cory. I am going to get at least 6. I have looked online at all the various species and like so many kinds. But many of the ones I like have black in them and will not show up well on a black substrate. I want one that will be noticeable of course, and would like some suggestions please. Also, please tell me if red shrimp will coexist with Corys and what fish I should keep them away from..I know I shouldn't have a goby with Corys or shrimp, correct? And lastly, if I get a small algae eater what would you recommend? Thank you and all of your team for sharing your knowledge with others, which in turn makes the hobby of fishkeeping easier and more enjoyable. I am not using white gravel but black sand as substrate. thanks. Thanks, which ones would you personally think look best on black substrate? <Boy that is tough... I REALLY like Pandas and Sterba's... but can't think of any members that I wouldn't keep. I looked through your forum and Googled my question and nothing came up about it, so I thought I'd try writing to you guys. We have a 10 gallon tank with 5 Silvertips, 1 Zebra Danio and two, small Panda catfish. As you probably are well aware of, the Silvertips can be very resourceful, mischievous little fish which can be a double-edge sword. What's happened is that whenever we now feed the catfish their small sinking food pellets, there is a male ST that will try to nip the other fish and steal their food, and now the more shy Panda won't eat. It also looks like there might be some little "nip marks" on that particular Panda's tail, so now it's become kind of a hassle/ordeal. Is there something I can do to prevent this from happening--this situation only comes when there's food around, the rest of the time everyone gets along fine, but my main concern is about that particular Panda (who incidentally has been hiding a lot more lately which is unusual for it). I was thinking maybe there's some kind of a net/barrier thing that I could put in the tank to keep everyone separated while I'm feeding them? I'm really not quite sure what to do about this… what initially started off as "cute" behavior has quickly become pesky, and very high maintenance! Thanks for responding to my question, and yes, I think you're right, we probably do a larger tank, but unfortunately, we don't really have the room for it where we're living now. A larger tank will probably be on the horizon for us, and then we'll add more, and as you said, these problems will be avoided. but with a 16 gallon I'd like just one. I read they prefer groups, but is that mandatory? I don't want the fish under too much stress. I am in the planning stages of a "Cory Only" aquarium, and the WWM website has by far been my greatest asset. That being said, it seems that either this idea is not particularly popular, or that there is little information about it. I have tentatively decided on a glass 30 Gallon Breeder tank (36Lx18Wx12T), as it seems this is the largest (volume-wise) shortest (height-wise) tank available, with the exception of a custom tank which will probably not be a viable option for me. which seemingly suggests (about 1/3 the way down the page) that Corydoras only require approximately 4 square inches of space each, which I can't help but think is a horrible guideline for stocking Corys (I'm imagining 50 Corys in a 10 gallon tank at the moment). What would you suggest? 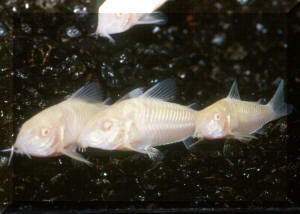 I was just wondering if it is harmful to keep just one Corydoras catfish? I have a 10 gallon tank with 6 Neons and one Corydoras. Is one alone stressed out since they are so social?? Hello Crew, Hope all is going well. I have a question, please. I have a 75 gallon fw tank with 6 medium sized angelfish. I have read that if 2 pair off for mating they can get aggressive towards others in the aquarium. Does this mean that they have to be removed or is a 75 gallon tank large enough so that the others can still live in peace? I am trying to help some friends with their aquarium, and would appreciate some stocking advice. Here is the setup: They have a 20 gallon aquarium, that is 24 inches long. It has ordinary (non-calcareous) aquarium gravel, with plastic plants, and is filtered by a Hagen AquaClear, that turns the water over 7 or 8 times per hour. I have that filter stocked with Hagen's bio-ceramic media and synthetic filter floss. These ladies follow proper procedures for cleaning the filter and doing weekly, partial water changes. They vacuum half the substrate each month. They also know how to feed properly, without over-feeding. Their tap water comes out of the faucet at ph 7.8, and is hard, but not VERY hard. (I can't recall the dh numbers right now.) They use Cycle on their tap water, and allow it to sit for three days before placing it into the tank. and are there varieties of Corydoras that should be avoided, because they will not adapt, (as well as others), to the hard water? species. Thank you, so much, for what you do! Have a great, fishy day!